If you are frustrated with diets that have too many do's and don'ts to remember, The No S Diet is for you. Just a few basics to remember and you're good to go. 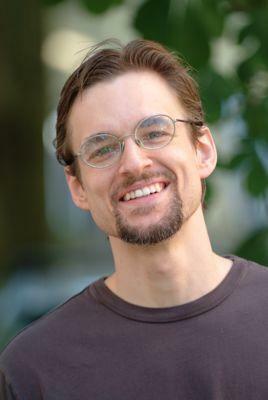 Learn more in the following interview with the creator of this diet, Reinhard Engles. Why did you write The No S Diet? 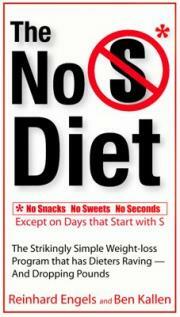 I came up with the No S Diet to solve my own personal problem of being overweight back in late 2001. I'd always tended to be what my mother would charitably describe as "hefty" and I was just tired of it. I love food, I love to cook, and so the commercial diet plans available at the time didn't seem remotely appealing. I think I would rather have stayed "hefty" than give up carbs or be reduced to eating expensive and disgusting pre-packaged diet food. So I came up with the No S Diet. This cutesy nursery rhyme, as a successful no-s-dieter recently called it:No snacks, no sweets, no seconds -- except on days that start with S.
It's basically just a mnemonic for moderation, a snappy reformulation of conventional wisdom about diet from a generation or two back. I don't think I seriously expected it to work at the time - it seemed too cute, and too obvious. But it also didn't seem like there was any harm in trying. It wasn't like there was anything especially dangerous about eating essentially like people have eaten for generations--three square meals a day with sweets and excesses reserved for special occasions--so I thought I'd give it a try. And I was amazed to discover that not only did it work - I lost 40 pounds in a year - but that it was surprisingly easy, even pleasant. Although I was eating less food, I was enjoying it more than I ever had before. And I've been steadily maintaining going on eight years now. Being a computer programmer, it seemed like a natural thing to put up a web site describing the No S Diet and the success I'd had with it. I tried to write it in an entertaining way, because I figured no one is going to believe this anyway, and I might as well defuse their objections by having a sense of humor about it. At first, no one knew about it except my family and friends and people I'd personally harassed into looking at it. But after a few months, much to my astonishment, I started getting emails from total strangers, who not only found the No S Diet an amusing concept, but had actually tried it and lost weight on it. I responded by beefing up the site and setting up a bulletin board, which now has thousands of members, some of whom have lost a lot more weight than I have - 60, 80, 100 pounds, and kept them off several years going. An editor at a major publisher (Perigee/Penguin) noticed the success that the site and the plan were having, and offered me a book deal. As a former English major, it was a no brainer to jump at this opportunity. You might not think that there would be much point in buying a book that gives away the entire "secret formula" on the cover, but the book is selling well. The reviews on Amazon have been great and word of mouth really seems to be spreading. The rules seem ridiculously simple, but I've been amazed at the number of questions I've gotten about them over the years. So here are some quick clarifications about each of the three rules - and the exception.By "no snacks" I mean when you eat not what you eat. I mean cut out all between meal eating. If you want to eat snack-type food during a meal, you're technically allowed to, though I don't think you'll wind up doing this much, because a plate full of cheese puffs looks really weird. There are several reasons why I think it's important to target the "when" and not the "what." Most importantly, it's clearer. You can get into all kinds of debates as to what exactly snack food is. Meal vs. not meal, if you're eating a fix number of meals, it's dead obvious. There's no ambiguity or scope for self-deception. And if you want to build automatic habits, you need your rules to be that simple and obvious. By "no sweets" I do NOT mean no sugar. I mean no food that has so much sugar in it that it could qualify as a desert. You don't need to drive yourself crazy checking ingredients. Your taste buds will let you know. And don't worry that this isn't enough. We consume an astonishing amount of sugar in the United States in the 21st century. You don't have to cut out every teaspoon to make a huge difference. Just cut out the sugar that's really obvious during the week, the sugar that's relatively easy to cut out, and you will cut out plenty. By "no seconds" I mean stick with one physical plate per meal - and no refills. The critical thing is to force yourself (and everyone around you) to see how much you are eating. If there's any excess, it will jump right out at you; it will look excessive. The no seconds rule is important because it prevents self-deception. If you keep going back for seconds and thirds it may never look like you're eating a lot, because you never see it all at one time. You sneak the excess past even your own observation. With no seconds, you can't do that anymore. "Days that start with S" include the obvious Saturdays and Sundays and also "Special days" like your birthday and major national and religious holidays. These are the days on which it's hardest to diet anyway; days on which there's the most temptation. We all need a break from rules some time, so why not pick the times when the rules are hardest to follow? The other advantage is that these days are well defined. Monday is clearly not Saturday. If you're sitting in your cubicle it's clearly not a holiday. The calendar provides a very well defined, familiar structure to keep these "S-day" exceptions from spinning out of control. The No S Diet works on two levels. Firstly, as a bunch of explicit rules that you consciously follow, it directly reduces excessive eating with a minimum of effort. It targets just the most egregious, most easy to recognize and really unnecessary forms of dietary excess, the low hanging fruit. You get a lot of bang for your willpower buck. You don't have to scratch your head or drive yourself crazy looking for mysterious, invisible stab-in-the back ingredients, you just cut out the obviously excessive stuff. And it's nothing you can't comfortably do without, long term. Three square meals is how most of our ancestors ate - if they were lucky. This isn't deprivation.But even more powerfully, by following these conscious rules you build unconscious habits. Your mind and your body start to associate eating with meals. By Pavlovian association, you learn that mealtime is the time to get hungry, not in between. It really is like training an animal. After a while, you no longer even really want to have snacks between meals, or go beyond a single plate. It would feel weird. That little up front investment of willpower builds habit that starts working for you. The No S Diet can be a little hard up front, but it gets easier and easier as your habit grows. This is exactly the opposite from the way most diets work, which start out deceptively easy and then become harder and harder. There's no way to make counting calories an automatic habit for example. It's always going to take conscious effort. And that effort is only going to seem more and more onerous and boring once the initial novelty wears off. It varies tremendously, but I advise people to expect it to be very slow. This isn't a quick fix, "lose 20 pounds in two weeks and then gain in all back again with interest" diet. It's a long term, life-term, program of moderation. The bad news is that you're probably going to have to be patient, that you're probably going to have to wait to see results, but the good news is that it's going to be a very enjoyable wait - and the results you do see are more likely to last. It's easy to lose weight quick. Who hasn't done it a dozen times already? The trick is making the results last. And that's what the No S Diet excels at. The No S Diet is a moderate system, so you need to actually, literally follow the rules if you want to see results. What I recommend is keeping a Habit Calendar. For every day you successfully comply with the No S Diet, make a green mark. On exempt S-days, make a yellow mark. If you slip up, make a red mark. Kind of like a traffic light. This not only helps you keep track of your compliance, but it's also surprisingly (if somewhat irrationally) motivating. Once you get a string of green days up there you really don't want to see a red! You don't have to do this forever, just until you're really confident you have the habit down. You can do this with a regular old paper calendar, but I also have a free online version called the HabitCal. The side effects of the No S Diet are almost more unbelievable than its direct results: yes, you'll probably lose weight, but you'll also stop obsessing about food all the time, and actually learn to enjoy it again. People who practice the No S Diet are often surprised not only that this happens, but that it means so much to them. They wake up to this great pleasure that they'd almost forgotten existed. People often worry that No S doesn't explicitly address the problem of good nutrition, of choosing healthy foods over unhealthy ones. But I think that first off, most people's biggest nutritional problem these days, at least in the first world, is simple excess. Don't let nutritional fine tuning distract you from that. If you're 50 or 100 pounds overweight, you don't really have any business worrying about antioxidants. Secondly, though No S doesn't explicitly address nutrition beyond this issue of excess, it does so as a kind of side effect. Having a limited number of single plate meals forces you to take them a little more seriously. The plates are like a spotlight, making your nutritional choices more conspicuous. Sometimes you'll make bad choices. But you won't really be able to do it without noticing. They'll look bad. And that gentle pressure on your eyeballs will be enough to nudge you towards making better nutritional choices more often. Not every time--that isn't even necessary--but often enough to make a decisive difference long term. LoveToKnow would like to thank Reinhard Engles for taking the time for this interview. You can learn more about the No S Diet by visiting his website, NoSDiet.com.